I know it sounds lazy, but you don’t actually need the crust to get the homey goodness of pie. I made this pie without any pastry and it was so good that I didn’t notice it was missing. I like to call it “naked”. The key to success is to use the in season fruit that surrounds us. Bartlett pears are in season and so are cranberries. Combine the two with some sugar and you have a sweet and sour tasty dessert. Serve this warm with some ice cream or just eat it cold. This looks festive because of the cranberries so you could serve it at Christmas or as a lighter alternative to pumpkin or pecan pie. Of course, I want you to enjoy your favorite pie on Thanksgiving and just forget about the calories. But, maybe you are looking to try something new. I am saved every year from the calorie bomb that is pecan pie because both my husband and daughter are allergic to pecans. No one in my house is allergic to pumpkin (or eggs, cream, and copious amounts of sugar), so there is always a pumpkin pie to contend with. How do you cope with holiday pies? How can we add your recipes to pinterest? I use this for crustless pumpkin pie. It's almost like a baked pudding and low in PP! Beat together until smooth. Pour into a greased pie plate. Bake at 400 degrees for 15 min. Reduce heat to 350 degrees and bake another 45 min. Serve with Cool Whip. If you like your pie fillings more tart, you can make this even more healthy by cutting out the sugar. Many fruits are easily sweet enough by themselves not to need it. And for an interesting twist, to add a touch of sweetness back, substitute the water and sugar for a fruit juice, such as cherry, apple or peach. Both the pear and the pumpkin (rosco) sound great. I love it!! So natural and delish! I actually don't like pie crust (unless it's a graham cracker crust) so this works well for me. I also make the crustless pumpkin pie and apple crisp. I had another thought: if you'd like a little texture or crunch, you could always scatter some flaked almonds on top, or even chopped hazelnuts or macadamias. Another alternative if you're not so worried about calories/carbs/gluten but just can't be bothered with pastry would be to do a crumble. You can also rub chopped nuts and/or oats into a crumble, and it's delicious. @Mikki - there is a Pinterest button to the right of the photo under the Twitter one. Please pin! This sounds amazing I think I am going to try it for a work functions, Thank you for sharing! I cope with the Holiday Pie, by not buying what I like. Pumpkin is OK, but I can say no to it, but put out a banana or chocolate cream pie and I am done for. So I just buy pumpkin! Noreen - here are 2 recipes I have in my list of recipes to make. They sound good. Maybe technically not parmesan -but are they close enough? 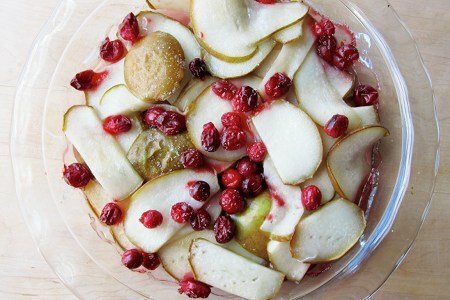 I'm going to try this using 1/2 pear and 1/2 apple. That pie looks incredible! Can't wait to try it! This is delicious. Even my non Weight Watcher husband likes it. Will make this again and again.